A 365 Project is a photography project, you take 1 photo each day for a year on a subject of your choosing and share it with the world. So.. What's all the fuss? Recently there has been a big hype about 365 Projects, everyone seems to be doing one, each with their own individual take on the subject. Some people take photos of themselves, others take photos of just one object, some take photos of their daily meals and others, like me, just take photos of every day life. Taking photos every day will improve your photography skills, there's no doubt about it, using your camera so much will teach you about lighting, composition and creativity. Forcing yourself to come up with new ideas and making you look at life a little bit differently. Documenting you life will help you see clearer, it's a great way to document what you spend your time on, your bad haircuts and your creativity. The number one reason for me is that it's a visual diary, Imagine being able to look back on everything you've done, all those new places, new people and awesome nights out! Sometimes you'll feel like there is nothing to take a photo of, that nothing exciting is happening, when days like this come around, and believe me, they come! Pick yourself up and force yourself out of the house and start taking pictures. Telling your friends about the project will keep you interested, people will start asking if they can be in your picture or what your going to take today, people find it really interesting to talk about too, this all adds up to encourage and remind you to take better photos! Here are my all time top 4 rules to remember on your journey into the 365. Don't wait to post your images, get them uploaded within a day or two so you don't end up with a huge backlog! Pick a theme to start with, it will keep you focused and make it easier to remember to take your photo. I'd love to hear why you started your 365 Project in the comments. If you haven't already... Get signed up and get shooting! \\My girlfriend actually got me doing the 365. And you know what? I love it! It's amazing just how much my photography skills have improved! I mean, I'm no Peter Van Allen or Lauren Dalhauser or anything, ha ha, but I like to think that I'm coming along pretty well! :-) I just would like to thank 365 for all the support! Thank you Ross for starting such an amazing site! You have to be so proud when you see the amazing photos being shared here. I started the project when I saw my daughter's pictures come to her facebook page every day. I got curious and asked her about it. I joined and that was that. I'm hooked! I started today ahhhhh! I just began doing this. I decided to take this up to increase my photography skills and partner up with my 2 cameras. I've seen other people do 365 projects, and I just think it's really cool to have a project of this sort. Shows discipline. I've tried before, and 2011 is all about accomplishing goals, so I'm excited to see if I can finish it this year. I have been taking photographs for a very long time - since the days of glass plates and manual cameras. Now retired, I still go out every day, with a digital camera in my pocket, and post to several groups and fora under separate categories but the idea of just 'one picture a day' immediately appealed to me as a daily record of my life. Some days it will be difficult to edit down to just one, and perhaps on other days it might need a bit of effort to actually find one worth posting, but it's a challenge I am really looking forward to. I like the idea of observing my daily life and asking me everyday wich aspect of my life i want to look close . Thanks for giving us the possibility to share moments of life through the 365 project! I originally joined the 365 Project to follow friends who are submitting photos, and to learn more about photography in general. Then I started uploading and now I am carrying my camera everywhere with me. My pictures are not very good but the 365 Project has changed the way I look at the world. I started after watching Kevin Marcy's daily photos as he posted his progress on Facebook EVERYDAY. We both ride motorcycles and this project is a great way to document the rides. Quero registrar este ano atraves das imagens,este projeto é bem bacana. 365 has been the best for my photography. I view the world in a totally different way now. It really is an amazing place. Thanks 365!! I just joined and am not sure how to create my actual profile. It just leads me back to the basic info page. What am I doing wrong??? Thanks I joined beginning this year, and learning everyday. What a wonderful concept. Great initiative. Is there an iPhone app? Ive searched all over and can't find one? One of my friends is currently on the 365 project and I thought why not join so I did. My camera has been hibernating way too long and this will really help me get going again. I think this site is a great motivator and I’m thankful to have it at my finger tips and also to be able to make new connections with other people that share my passion. Thank you! A carer that used to attend a Carers Group that I used to run told me about it. I then googled 365 project and began on 27 October last year. At the time, my Mum was dying with cancer and I think it was a lifesaver for me because it took me away from all the hurt and pain she suffered for a few minutes each day at least. The support from everyone on 365 was wonderful and I know that I have learnt such a lot by trying the camera settings challenges, etc. My pics have certainly improved and it has helped me to really look at the world I live in as I am always looking for my next pic. I see things now that I would have totally overlooked. It really does open your eyes to the beauty around us. Thank you 365 for maintaining my sanity! A friend in my camera club was participating in 365 project and I decided to try it and see what happened. I joined because I was curious and because I thought my work could benefit from the daily practice.18 months later I am still posting and commenting daily. I have made some amazing friends and have learned a lot about the process of photography from the exif information. It is a wonderful community. Thanks, Ross! I was thinking on the road, what could i do to make my photography a more challenge. than i thought about making everyday a photo of things i like or do or ran up to. than i was googling the possibility's and found this site, sign up and now posting here. The theme u said to pick, is my life, my daily things. gonna try uploading everyday one photo. @artypics Go up to You and scroll down to Settings; you should be able to do everything you want there. My daughter is the 3rd generation photography ethusiast in the family and is on her second year of 365. She's been after me since she began to get involved myself. I resisted....... Retired, don't get out as much as she does. Well, she finally convinced me over Christmas. I've been doing it for almost two weeks now and wonder why it took me so long. I am HOOKED!! My daughter participated for a year, and I was feel like doing too. I think an excellent idea. This year I decided! the year 2013 is a special year for me: I was married for 25 years and now I will celebrate my 50th birthday. I'll make this year a special year. I will also try to improve my English, writing every day a phrase or comment. Mainly I will learn a lot about photography! I am now starting Year 3. I did not even intend to start a 365 project at all! My brother would link his daughter's (my precious 16 year old niece) photos SHE was putting on Project365 over to Facebook. I'd follow the link to see her pics. But I could not see any more than that one photo without signing in, or something like that. Plus, once I signed up so I could follow her work,she wrote back to me on Facebook and said "Hi, Maymay! Now I am following YOU!" I was like "WHAT?" I had no intention of taking a photo a day, posting them on 365, or taking up photography as a hobby. But....my niece and I had always loved to drag our cameras with us and shoot pics, so I thought I'd try it. Two years later, I am still loving it and learning so much! Just joined 365. Armed with a regular smartphone with HDR. I'll shoot them all. With good pictures, of course. There is a really cool and easy app I found called Slideshow 365 that allows you take create a project and it gives you daily reminders. 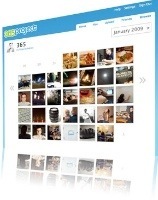 At the end of the year it allows you to create a video slideshow of all your photos! It lets you post the video of your slideshow on youtube, Facebook, and email. How cool!! I heard about this on the Today show, so Im starting tomorrow - 1st Jan 2014. As im travelling Australia, in our caravan this will be a good idea to document our travels. I started the 365 Project last year on my birthday (January 16, 2013) for a variety of reasons. First and foremost was the desire to learn how to use my new camera, an Olympus E-PL1 4/3 micro system mirror-less digital, which I got for Christmas 2012. The other motivators for doing the project were: (in no particular order) to increase the my quality of work, concentrate on good compositions, learn some fun and interesting Photoshop techniques and to chronicle a year in my life with pictures. The project at times was very hard to do. Some days I just didn't "feel" the love of photography or have the artistic eye for getting a great shot. Still, I pushed through and made myself take a photo every single day. I only had one day where I took exactly one photo, thank goodness, I managed to take it or the project would have been a bust! LOL Some days it was really fun to get out and do a shoot, only to discover that I had more than one great picture to choose from. I feel that my photos have increased in quality, and that there are more "great" shots in my final months than there were at the start of the project. I have learned a great deal about the camera! I know when to use certain settings (f-stops etc...), how to make sure my lighting is okay, when to use a tripod and how to frame a subject and how to post-edit with PSE. I think I still have a lot of mediocre shots too, but I feel better about what I am producing and have confidence that I won't come home with complete duds when I am out taking pictures. I had a lot of fun doing the project, but at times I hated it too. I am thrilled that I finished it properly, one photo for everyday of the year, and I am also a little bit glad that it is over. It was a lot of work and a big time commitment, so now I feel a little bit like a kid going on summer vacation! I especially enjoyed the creative side of it and am happy with the works of art I created and got to share with all of you. I started New Year's Day. I hadn't really planned to but someone had mentioned it to me several months before and as I had been given some photography equipment for Christmas I decided to give it a go. I must admit I had thought I would get more critique on my shots rather than just positive comments but you soon learn what is a good shot by the number of comments and Favs. I guess that is a critique in itself! I love the fact that you are sharing your life with so many committed and faithful people and friendships that form. Thank you. I took mine up for motivation, and limited myself to using a point and shoot camera which I could carry at all times, looking back on my efforts there is a improvement in the photos that I am taking and I know the workings of this little camera inside out, well worth the effort. @riverstardust Yes there is, it is no problem alternating between cellphone and pc. I still do most of my posts via cell. I joined 365 in December last year through recommendation of a friend who has been in the group for a long time. In the beginning I was an absolute novice, mostly using my cell or a small Canon Ixus . In the meantime I have changed to a Lumix TZ80, bought my first Pc, Lightroom and Photoshop Elements. I am totally hooked and take pics of everything that crosses my path. I love playing around with apps, due to lack of the perfect capture. Fortunately I live in an area where there is always something to shoot. I do not manage a daily shot as I don't go out daily. When I do get out, I take an incredible amount of photo's, of which most get deleted. I never leave the house without a camera now and 365 has made me see the world through different eyes. This is an awesome site with wonderful photographers and fabulous people!